Now that some of the hardware problems surrounding virtual reality, such as 1:1 head tracking and high frame-rate displays, are being resolved, the ways in which a player’s physiology can be brought in line with the mind are being looked to as the next step for complete immersion. This latest contraption aiming to do just that is called CableRobot Simulator and it’s one of the most unique motion platforms we’ve yet seen. CableRobot Simulator is a collaboration between the research group of Heinrich Bülthoff at the Max Planck Institute for Biological Cybernetics and the cable robot research group at the Fraunhofer IPA. 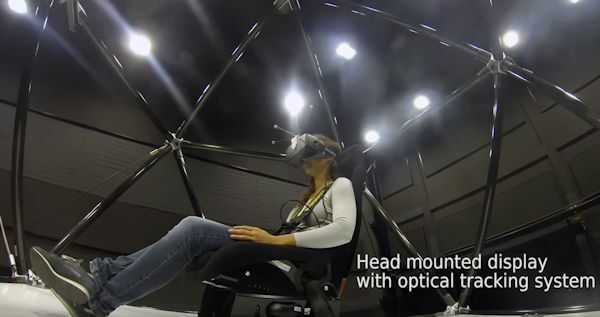 The CableRobot Simulator is comprised of a central ‘cockpit’ frame, complete with chair, harness, modified Oculus Rift DK2 and computer to power it. The central cockpit is attached to a series of motorised winches which are coordinated to apply or release tension to and from the cockpit in such a way as to allow elevation, descent and rotation of the platform – giving a full six degrees of freedom for movement (6DoF). The system is said to only be limited in terms of scale, by the room it occupies – although I’m fairly sure physics would step in to spoil the party at some scale. What the system offers that many fixed-base motion platforms [don’t] is a large degree of movement in the forwards / backwards, left / right lateral movements. The unit on display occupies a small warehouse, which means large swooping motions can be actioned upon the player seemingly with ease, making the job of fooling that clever physiology of [yours] all the easier. It has to be said, considering the debate that room-scale VR has brought about in terms of available space in homes, it seems unlikely many of us will be rushing out to procure such a device any time soon. And given the frankly lethal looking nature of the machine’s mechanics, we’re not sure if you’re likely to see it at a theme park any time soon either. There’s no doubt though that we’d absolutely love to give it a go!